Hi ! My name is Sevil A. Boz. I`m from Bulgaria,from a little town called Shumen. I`m sixteen years old. Hi ! My name is Sevil A. Boz. I`m from Bulgaria,from. 1 Hi ! My name is Sevil A. Boz. I`m from Bulgaria,from a little town called Shumen. I`m sixteen years old. Hi ! My name is Sevil A. Boz. I`m from Bulgaria,from a little town called Shumen. I`m sixteen years old. 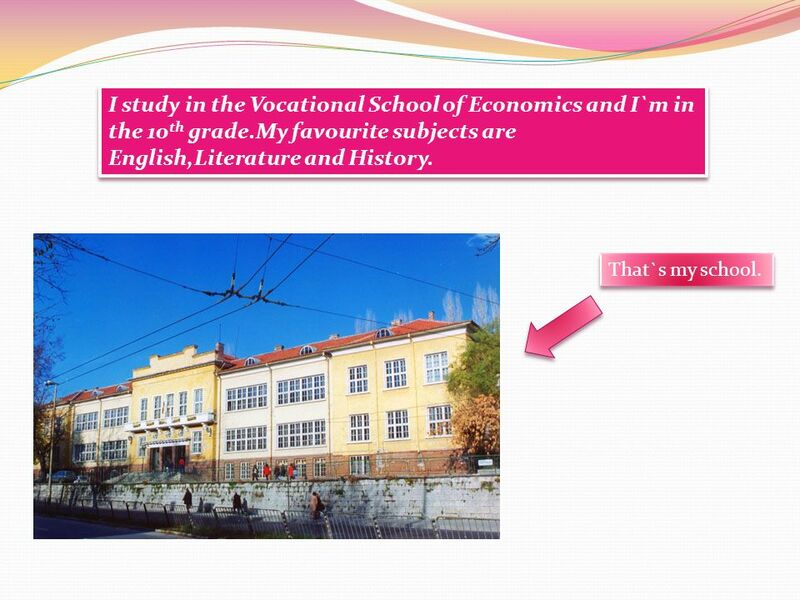 2 I study in the Vocational School of Economics and I`m in the 10 th grade.My favourite subjects are English,Literature and History. That`s my school. 3 My hobby is reading books. I like fantastic books. One of my favourites is the Twilight Saga. 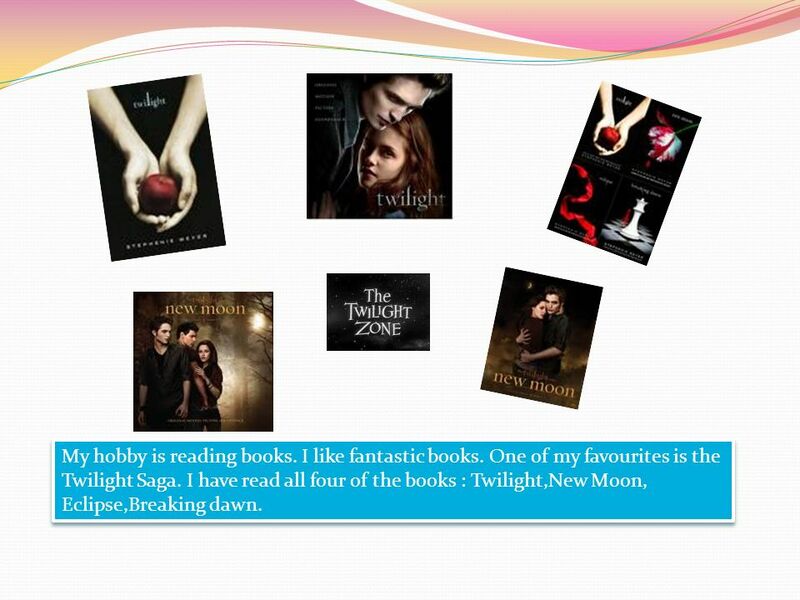 I have read all four of the books : Twilight,New Moon, Eclipse,Breaking dawn. 4 I also enjoy watching movies. 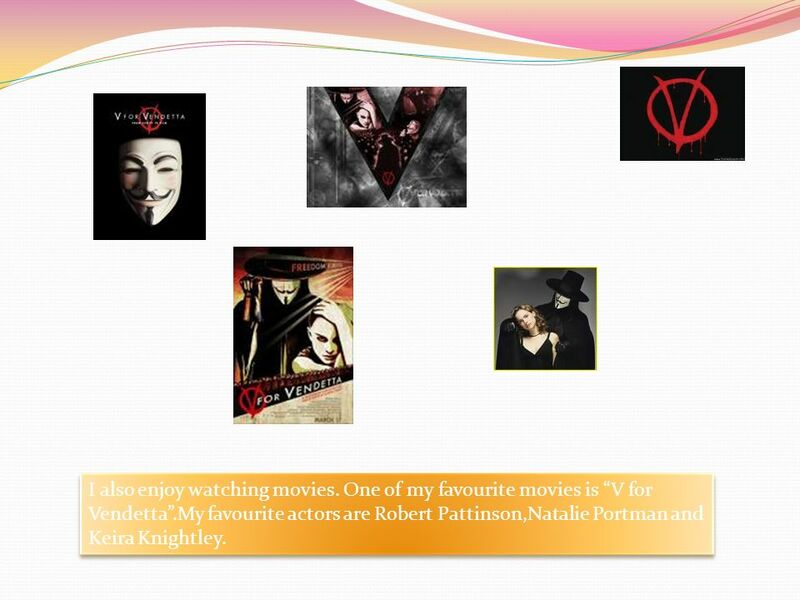 One of my favourite movies is V for Vendetta.My favourite actors are Robert Pattinson,Natalie Portman and Keira Knightley. 5 I love listening to different kinds of music but mainly I listen to pop and rock music. My favourite band is Kings of Leon. 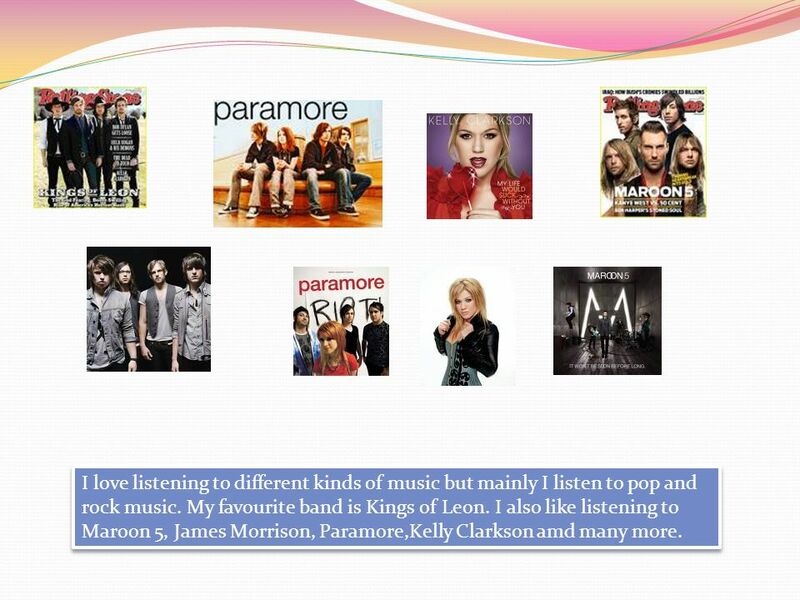 I also like listening to Maroon 5, James Morrison, Paramore,Kelly Clarkson amd many more. 6 This is my class ! 7 I have been in the History club for three years. I also participate in a club for Citizenship. I can`t wait to find new friends in eTwinning and learn about different cultures. Download ppt "Hi ! My name is Sevil A. Boz. I`m from Bulgaria,from a little town called Shumen. I`m sixteen years old. Hi ! My name is Sevil A. Boz. I`m from Bulgaria,from." Hi, My name is Nikoleta. I am sixteen years old..
Hi Hi My name is Hristomir Svetoslavov Stanev. I am sixteen years old and I live in Shumen. I am in 10. class in the Vocational school of economics in. Me and my family. Facts about me ● I was born in Lewisham Hospital, July ● 21 st ● I am 10 years old and I go to whitehill Primary School. ● I live. About Us.. Music In our group our favorite artists/bands are: Evanescence Donnie Mc Clurkin Kirk Franklin 116 Clique Paramore The Script Kings of Leon. ALL ABOUT ME -Sabrina Masters I love the stage and when I grow up I want to be a actress! All About Me Hobbies Food Favourites Food Facts Pictures of Me Credits. Greece - Poland: so far, yet so close 3 rd Primary School, Palaio Faliro 6 th grade. Hi, England, France, Italy, Portugal, Spain and Alavieska Here we come! The Comenius Club from Merij ä rvi. Hello! It’s our sunny greetings from Bulgaria Hello! It’s our sunny greetings from Bulgaria “St.st.Cyril and Methodius” DIMITROVGRAD. My hobby :) My name is Veronica. I'm 13 years old. I'm from Poland. TEENAGERS LIFE IN ENGLAND. TEENAGERS A teenager, or teen, is a young person whose age is between thirteen and nineteen Teenagers are an important part. ALL ABOUT ME!!! BY: JASMINE Hi!!!!!! My name. is Jasmine I am 11 years old. I am in 5 th grade. Hi, I'm Seánna I go to St. Mary’s College About me My birthday is on the 24 th of August and I am 16. I do many sport such as basketball, hockey, rugby. Hi! My name is Ashkhen. I am fifteen. I am from Vanadzor,Armenia. I like maths and physics.I like to read historical books, listen music and play. Hi! My name is Cimpoieru Bogdan and I am 16 years old student at Informatic High School “Grigore C. Moisil”, Iasi. I have medium lenght, brown hair, blue. Afonso Pais Antunes 5.º C 2010/2011. Hi, my name is Afonso. I am 10 years old. Everyone has a hobby. Hi, my name is Afonso. I am 10 years old. Everyone. This is our school. OUR E-TWINNING TEAM Karolina: „I’m Karolina and I’m twelve years old. I live in Szczuczyn in Poland. I like playing computer games. My Hobbies and Interests ANIL SENTURK AXS5327. Hobbies I love travelling, I`ve been to the US, Canada, France, Holland, Malta, Tunisia, Libya and Egypt. E-twinning: ’’ How are we same and different’’? Presentation of my new friend from Turkey..!!! ALL ABOUT ME BY: BRIANNA PAIGE.